I originally wrote this post for my first blog, California Eating, back in September 2006. Since then, I’ve tried to get my hands on Pink Pearl apples every year, even after we moved back to Massachusetts in 2007. Sadly, my normal supplier, Randy at Kiyokawa Family Orchards in Oregon, reports that their entire 2011 crop was lost to a blossom freeze back in the spring. And I’m too late for the California crop! Too bad. Anyone know of any other WA/OR sources? 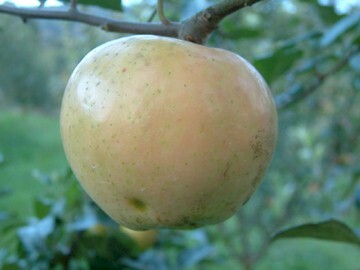 So here’s an apple you probably won’t find on the east coast: the Pink Pearl. Isn’t it pretty? Like the Gravenstein, it’s a summer variety, which means we’re now at the tail end of the season. Sigh. The breed is popular with apple enthusiasts, but because it bruises easily and doesn’t keep well in storage, it never made it to the supermarket shelves. 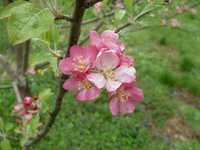 The first Pink Pearl was hybridized in Northern California in 1944 from another red-fleshed variety called “Surprise,” which, in turn, probably descended from an ancient breed of red-fleshed Turkish crabapples. “Surprise” apples were beautiful, but sour; a plant breeder named Albert Etter came up with with Pink Pearl as a way to breed more sweetness into them. So I’m giving thanks to him and to the farmers who keep these heirlooms in circulation. My granddaughter and I met you at Toscanini’s this afternoon and we talked a bit about the Roxbury Russet. Given that it’s one of the oldest varieties in the US and it was ‘discovered’ in my neighborhood over 400 years ago, any info that you turn up will be very interesting to me. So sorry that we had to run off, but you know… the hair appt. I went to Nashoba Valley Winery in Bolton, MA on Friday and found several Roxbury Russet trees in their antique apple orchard. This orchard is full of unusual varieties and you have to make an appointment to pick there. Red Apple Farm in Phillipston also grows them, and you don’t need an appointment. As for the history, I have a couple of calls out inquiring about the exact location of that orchard—I’ll let you know when I hear back. Meanwhile, I did learn that Bartlett Street in Roxbury was the site of a pear orchard, and that’s where the Bartlett pear gets is name. Isn’t that interesting?